According to the Historia Augusta, Elagabalus, the teenaged Severan heir, adopted the name of his deity and brought his cult image from Emesa to Rome. Once installed as emperor, he neglected Rome's traditional State deities and promoted his own as Rome's most powerful deity. This ended with his murder in 222. The Historia Augusta refers to the deity Elagabalus as "also called Jupiter and Sol" (fuit autem Heliogabali vel Iovis vel Solis). 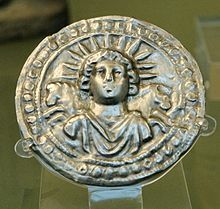 While this has been seen as an attempt to import the Syrian sun god to Rome, the Roman cult of Sol had existed in Rome since the early Republic. The Roman gens Aurelia was associated with the cult of Sol. After his victories in the East, the Emperor Aurelian thoroughly reformed the Roman cult of Sol, elevating the sun-god to one of the premier divinities of the Empire. Where previously priests of Sol had been simply sacerdotes and tended to belong to lower ranks of Roman society, they were now pontifices and members of the new college of pontifices instituted by Aurelian. Every pontifex of Sol was a member of the senatorial elite, indicating that the priesthood of Sol was now highly prestigious. Almost all these senators held other priesthoods as well, however, and some of these other priesthoods take precedence in the inscriptions in which they are listed, suggesting that they were considered more prestigious than the priesthood of Sol. Aurelian also built a new temple for Sol, which was dedicated on December 25, 274, and brought the total number of temples for the god in Rome to (at least) four. He also instituted games in honor of the sun god, held every four years from 274 onwards. The Philocalian calendar of AD 354 gives a festival of "Natalis Invicti" on 25 December. There is limited evidence that this festival was celebrated before the mid-4th century. Whether this date was intended to celebrate solstice is doubtful; one scholar writes that "the cult of the Sun in pagan Rome ironically did not celebrate the winter solstice nor any of the other quarter-tense days, as one might expect". Since the 12th century, there have been speculations that the near-solstice date of 25 December for Christmas was selected because it was the date of the festival of Dies Natalis Solis Invicti, but this has been contested by the Calculation Hypothesis through the writings of the Early Christian Fathers. For example, Hippolytus of Rome, between 202 and 211, said in his commentary of the Book of Daniel that the birth of Jesus took place on December 25. The manuscript also includes a passage which gives the Passion of Jesus as March 25. The halo of Jesus has similarities to a parhelion or a sun cross. According to historians about Christmas, it was set to 25 December because it was the date of the festival of Sol Invictus. This idea became popular especially in the 18th and 19th centuries. The charioteer in the mosaic of Mausoleum M has been interpreted by some as Christ. Clement of Alexandria had spoken of Christ driving his chariot across the sky. This interpretation is doubted by others: "Only the cross-shaped nimbus makes the Christian significance apparent", and the figure is seen by some simply as a representation of the Sun with no explicit religious reference whatever, pagan or Christian. 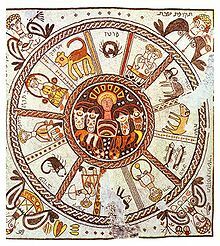 The traditional image of the Sun has also been used in early Jewish art. A mosaic floor in Hamat Tiberias presents David as Helios surrounded by a ring with the signs of the zodiac. 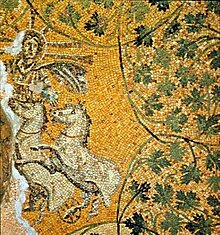 As well as in Hamat Tiberias, figures of Helios or Sol Invictus also appear in several of the very few surviving schemes of decoration surviving from Late Antique synagogues, including Beth Alpha, Husefa, all now in Israel, and Naaran in the West Bank. He is shown in floor mosaics, with the usual radiate halo, and sometimes in a quadriga, in the central roundel of a circular representation of the zodiac or the seasons. These combinations "may have represented to an agricultural Jewish community the perpetuation of the annual cycle of the universe or ... the central part of a calendar". ^ As Hijmans states (p.115): "Scholars have consistently postulated a clear distinction between the Republican Sol Indiges and the Imperial Sol Invictus." and p.116 "We should keep in mind, however, that most scholars agree that this cult [Sol Indiges] was never important, and that it had disappeared altogether by the beginning of the second century AD"
^ Halsberghe, "The cult of Sol Invictus", p.155: "Up to the conversion of Constantine the Great, the cult of Deus Sol Invictus received the full support of the emperors. The many coins showing the sun god that these emperors struck provide official evidence of this." and p.169 "the custom of representing Deus Sol Invictus on coins came to an end in AD 323." ^ Halsberghe, "The cult of Sol Invictus", p.170 n.3: "CIL VI, 1778, dates from AD 387,"
^ Hijmans, S. E. (2009). "The sun which did not rise in the east", p. 124. ^ Hijmans, Steven Ernst. (2009). Sol: The Sun in the Art and Religions of Rome (diss., University of Groningen 2009), p. 18, with citations from the Corpus Inscriptionum Latinarum. ^ Hijmans (2009, pp. Chapter 1) (a reworking of Hijmans, 1996; Matern, 2001; Wallraff, 2002; and Berrens, 2004; all follow Hijmans. ^ CIL VI, 715: Soli Invicto deo / ex voto suscepto / accepta missione / honesta ex nume/ro eq(uitum) sing(ularium) Aug(usti) P(ublius) / Aelius Amandus / d(e)d(icavit) Tertullo et / Sacerdoti co(n)s(ulibus) "Archived copy". Archived from the original on 2011-07-16. Retrieved 2009-11-12. CS1 maint: Archived copy as title (link) (Publius Aelius Amandus dedicated this to the god Sol Invictus in accordance with the vow he had made, upon his honorable discharge from the equestrian guard of the emperor, during the consulship of Tertullus and Sacerdos); see: Campbell, J. (1994). The Roman army, 31 BC–AD 337: a sourcebook, p. 43; Halsberghe 1972, p. 45. ^ An illustration is provided in Kantorowicz, E. H. (1961). Gods in Uniform, 368–393, 383, fig. 34 Proceedings of the American Philosophical Society, 105(4), (August 1961). ^ Ulansey, David. (1989). The Origins of the Mithraic Mysteries, p. 107. Oxford University Press. ^ Salzman, Michele Renee. (2004). Pagan and Christian Notions of the Week in the 4th Century CE Western Roman Empire In Time and Temporality in the Ancient World, p. 192. University of Pennsylvania Museum of Archaeology and Anthropology. ^ Alvar, Jaime, tr. Gordon, Richard (2008). Romanising Oriental Gods: Myth, Salvation, and Ethics in the Cults of Cybele, Isis, and Mithras, p. 100. Brill. ^ See in particular Halsberghe 1972. ^ Hijmans 1996, Matern 2001, Wallraff 2002, Berrens 2004, Hijmans (2009)). ^ For a full list of the pontifices of Sol see J. Rupke (ed. ), Fasti Sacerdotum (2005), p. 606. Memmius Vitrasius Orfitus lists his priesthoods as pontifex of Vesta, one of the quindecimviri sacris faciundis, and pontifex of Sol, in that order (Corpus Inscriptionum Latinarum vol. 6, 1739–1742). In a list of eight priesthoods, Vettius Agorius Praetextatus puts Pontifex Solis in third place (CIL VI, 1779). ^ Dirven, Lucinda (1999). The Palmyrenes of Dura-Europos: A Study of Religious Interaction in Roman Syria. BRILL. p. 169. ISBN 978-9004115897. Archived from the original on 2015-12-08. ^ Forsythe, Gary (2012). Time in Roman Religion: One Thousand Years of Religious History. Routledge. pp. 142–143. ISBN 978-0415522175. ^ A comprehensive discussion of all sol-coinage and sol-legends per emperor from Septimius Severus to Constantine can be found in Berrens (2004). ^ Excellent discussion of this decree by Wallraff 2002, 96–102. ^ E. Marlowe, "Framing the sun. The Arch of Constantine and the Roman cityscape", Art Bulletin 88 (2006) 223–242. ^ S. Berrens, Sonnenkult und Kaisertum von den Severern bis zu Constantin I. (193–337 n. Chr.) Stuttgart: Steiner 2004 (Historia-Einzelschriften 185). ^ Berrens 2004, precise p. number to follow. The coinage Elagabalus does not use invictus for Roman Sol, nor the Emesan Solar deity Elagabalus. ^ Bergmann 1998, 116–117; Hijmans 2009, 82–83. ^ Wallraff 2001: 174–177. Hoey (1939: 480) writes: "An inscription of unique interest from the reign of Licinius embodies the official prescription for the annual celebration by his army of a festival of Sol Invictus on December 19". The inscription (Dessau, Inscriptiones Latinae Selectae 8940) actually prescribes an annual offering to Sol on November 18 (die XIV Kal(endis) Decemb(ribus), i.e., on the fourteenth day before the Kalends of December). ^ Text at  Archived 2007-12-04 at the Wayback Machine Parts 6 and 12 respectively. ^ "The Day God Took Flesh". Melkite Eparchy of Newton of the Melkite Greek Catholic Church. 25 March 2012. Archived from the original on 23 December 2014.